All Automaton Motion Server products are shipped with a fully tested and verified installation of Aerotech’s A3200 motion controller operating in a 64-bit Windows operating system. The Motion Server is ready to work right out of the box — apply power, connect the drives, and start developing. You’ll waste no more time on PC selection, operating system activation/configuration, controller installation, and managing deliveries from multiple vendors. Get started on integrating your value-added process as soon as you open the box. 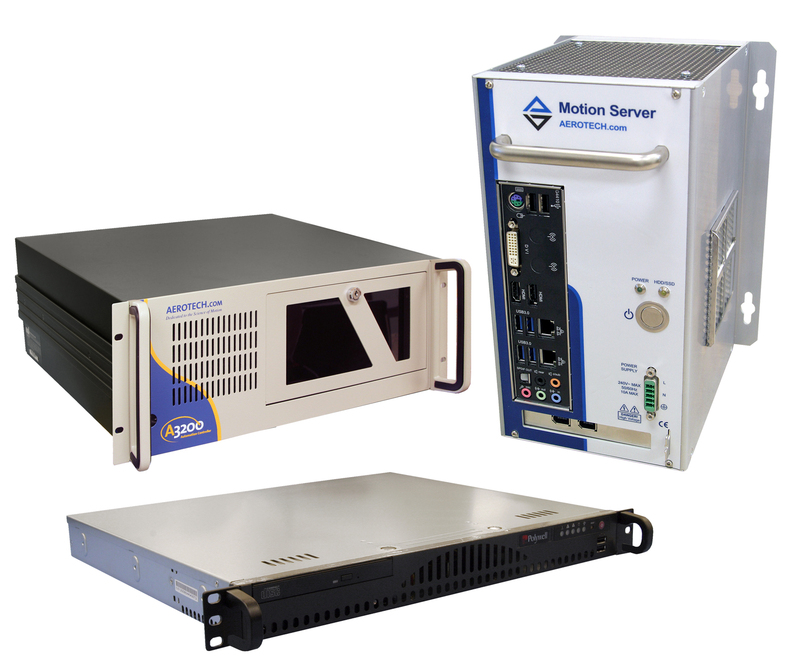 The Automation Motion Server is available in panel-mount and rack-mount versions. The panel-mount version is designed for integration into a control cabinet. The slotted ‘key-hole’ mounting pattern makes for easy insertion and removal from the cabinet, and a liquid cooled heat-sink and solid-state disk-drive ensure reliable operation up to 50°C. The rack-mounted version is available in 1U and 4U heights with rear-accessible internal PCI expansion capability. Communicate with EtherCAT or PROFINET fieldbus I/O with an optional universal dual-port Ethernet adapter. A real-time enabled Ethernet port can also be installed to communicate with intelligent cameras and other peripherals through Modbus/TCP.